For this example, we will use the hymn There Is A Fountain. 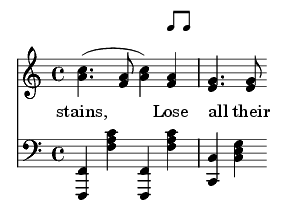 Look at the song, There Is A Fountain, at the fourth beat of the tenth measure (the word “Lose”). In this situation, a short chromatic run can be played, overlaying the melody. Since this is a slower song (and since the beginning note and target note are so close together), play the run in eighth notes. The beginning note is A, taken from the melody. 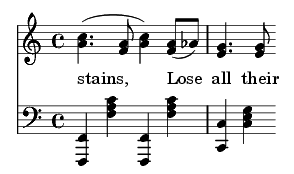 The ending note is G, also taken from the melody, the first beat of the next measure. Since there is only one eighth note to add, and only one note between the A and G, it should be obvious that the Ab will be the note to fill in. This fill works for two reasons. First, the chromatic note (Ab) is not on an accented part of the beat, so even though it is not in the chord or scale, it is not played long enough to have an adverse effect on the music. Second, the eighth note pattern is consistent with the melody rhythm in the rest of the song. Some may ask, “But why didn’t you use triplets?” The answer is Step #6, “Make Sure It Sounds Good”. This song is slower, and is normally played with very even eighth notes. 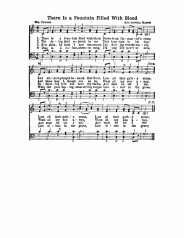 While many evangelistic songs are played with a swung feel (which lends itself to the eighth note triplets), this song almost never is. Since, as a pianist, you goal is to enhance the music, you should refrain from using triplets in this song, unless you are using it for a specific reason. There is no clear-cut guideline as to whether or not you should use triplets, but all that is needed is a little bit of familiarity with what is possible, and you will soon be making a good decision. These examples should help you understand that, in music, anything goes, as long as it sounds good, and does not detract from the message of the song.